We focus on the creation and development of next-generation nano-sized functional materials by controlling electronic, photonic, and spin states as well as fabrication methods. We investigate fundamental and applied studies on living radical polymerization; current projects include the development of living radical graft polymerization initiated from various organic, inorganic, and metallic surfaces as well as studies on the structures, properties, and functions of newly created surfaces or “concentrated polymer brushes”. 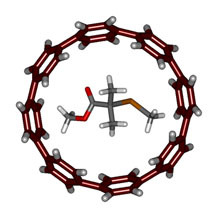 Our research program focuses on developing precision polymer syntheses based on the control of reactive intermediates as exemplified in carbon centered radicals, and the design and synthesis of hoop-shaped π-conjugated molecules through the precision syntheses of metastable organometallic complexes. We also study various polymer condensed states to understand the relation between physical properties and structures. Structures of a control agent of radical polymerization and a hoop-shaped π-conjugated molecule developed by our group. 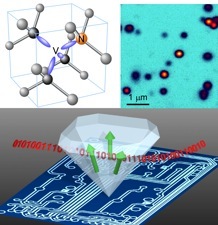 We investigate an NV center (Nitrogen-vacancy complex) in diamond. We can optically observe the single NV center at room temperature and detect single spins in it. From its excellent properties, it is expected to be applied for ultra-sensitive and ultra-high resolved sensor, bio-marker and quantum information devices. Spintronics, which aims to completely control the spins in solids, is one of the most active fields due to its impact on information technology. By combining the atomic-layer deposition with nanofabrication, we focus on the development of spin properties in various materials and the control of quantum effects in mesoscopic systems for novel spintronics devices. Numerical simulation result of the reversal of the magnetic vortex core.